Villarreal keeper Sergio Asenjo has written off Rangers’ chances in the Europa League, predicting Spartak Moscow will join them in the knock-out phase. The Ibrox squad will fly to Spain for their first game in Group G on Thursday. New Rangers boss Steven Gerrard has blasted his squad, despite picking up three points at home to Dundee. Insisting he expects more from the team, he said he was frustrated by his side’s missed chances. He said: “I’m not sure we got a performance. I want as many goals as we can. 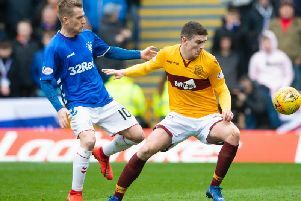 Hearts extended their lead at the top of the Premiership after defeating Motherwell on Saturday but they did so courtesy of a goal that would not have stood if the referee had been able to use VAR, insisted Well manager Stephen Robinson. Having re-watched the build up to Stephen Naismith’s 29th-minute goal, Robinson said footage convinced him that Hearts striker Uche Ikpeazu whould have been punished for his challenge on Motherwell keeper Trevor Carson and the goal chalked off. Stevie Clark was once again on the war path with the SFA after a late penalty call cost Kilmarnock a point. The Rugby Park boss said it was another error on the part of the SFA after being denied a penalty at the other end after a challenge on Kirk Broadfoot. Celtic boss Brendan Rodgers has instructed his side to dust themselves off and not feel sorry for themselves after losing out on a Champions League spot. Rodgers had high hopes of the team making their third consecutive appearance in the Champions League group stages before crashing out against AEK Athens. Shrugging off the disappointment of a nil-nil draw against St Mirren earlier in the week, Leith Griffiths said he was relishing Celtic’s first Europa League tie against Rosenborg at Parkhead on Thursday.